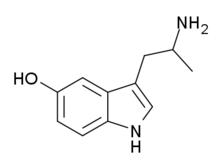 α-Methylserotonin (αMS), also known as α-methyl-5-hydroxytryptamine (α-methyl-5-HT) or 5-hydroxy-α-methyltryptamine (5-HO-αMT), is a tryptamine derivative closely related to the neurotransmitter serotonin (5-HT). It acts as a non-selective serotonin receptor agonist and has been used extensively in scientific research to study the function of the serotonin system. Unlike serotonin, αMS is not metabolized by monoamine oxidase on account of the α-methyl substituent blocking the enzyme access to the amine. As a result, it has a much longer half-life in comparison. Similarly to serotonin however, αMS poorly crosses the blood-brain-barrier due to its free hydroxyl group, and thus has only weak or no central effects when administered peripherally. α-Methyltryptophan (αMTP) is a prodrug to αMS which does cross the blood-brain-barrier and thus efficiently delivers αMS into the central nervous system. As a result, αMTP acts as an orally bioavailable false or substitute neurotransmitter for serotonin, and has been suggested as a possible therapeutic agent in the treatment of disorders where serotonin is deficient. The O-methylated analogue of αMS, 5-MeO-αMT, also readily enters the brain and could be used for this purpose as well. 5-Hydroxy-alpha-methyltryptamine is not scheduled at the federal level in the United States, but it could be considered an analog of alpha-methyltryptamine (AMT), in which case, purchase, sales, or possession could be prosecuted under the Federal Analog Act. 5-Hydroxy-alpha-methyltryptamine is a Schedule I controlled substance in the state of Florida making it illegal to buy, sell, or possess in Florida. ↑ Ismaiel AM, Titeler M, Miller KJ, Smith TS, Glennon RA (February 1990). "5-HT1 and 5-HT2 binding profiles of the serotonergic agents alpha-methylserotonin and 2-methylserotonin". Journal of Medicinal Chemistry. 33 (2): 755–8. doi:10.1021/jm00164a046. PMID 2299641. 1 2 3 "Erowid Online Books : "TIHKAL" - #48 a-MT". ↑ Diksic M, Nagahiro S, Sourkes TL, Yamamoto YL (January 1990). "A new method to measure brain serotonin synthesis in vivo. I. Theory and basic data for a biological model". Journal of Cerebral Blood Flow and Metabolism. 10 (1): 1–12. doi:10.1038/jcbfm.1990.2. PMID 2298826. 1 2 Sourkes TL, Montine TJ, Missala K (1990). "Alpha-methylserotonin, a substitute transmitter for serotonergic neurons". Progress in Neuro-psychopharmacology & Biological Psychiatry. 14 (5): 829–32. doi:10.1016/0278-5846(90)90055-l. PMID 1705718. 1 2 Sourkes TL (1991). "Alpha-methyltryptophan as a therapeutic agent". Progress in Neuro-psychopharmacology & Biological Psychiatry. 15 (6): 935–8. doi:10.1016/0278-5846(91)90020-2. PMID 1763198. ↑ "Erowid Online Books : "TIHKAL" - #5. a,O-DMS".